Just Another Day in Japan: "Can you eat X?" The other day I was talking to Yoshie and cleared up kind of a longstanding Japanese misunderstanding. We got onto the topic of "soba" for some reason and she wondered if I could eat 茶そば (cha soba), that is soba noodles flavored with green tea powder. Now I didn't get irritated...and I had a suspicion that the English and Japanese kind of differ here. But the way she asked me was: ポールは茶そば食べれるの？Literally asking me if I can eat cha soba. I've had foreign friends vent their frustration to me in regard to this line of questioning, and frankly I've been annoyed by it as well. Can we eat sushi? Can we eat tofu? 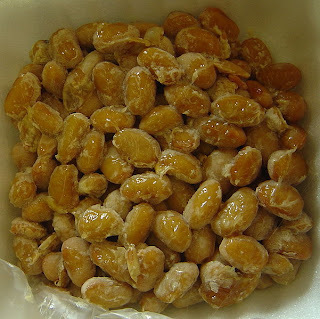 One of my friends has said to me that when asked whether he "can eat natto" he replies "Well I can. I just don't like to." Yoshie has never been like that...I've never known her to assume that because I or any other foreigner is a foreigner that we're any different than Japanese people (cultural values and upbringing aside). So when she asked me this, something clicked and I asked her about it. When you ask if I can eat it, do you mean can I physically eat it, or do I like it? She seemed confused for just a moment and said she meant to ask whether or not I like it* (see edit below). I explained that in English, using a potential form like that asks about the possibility or capability of doing something (eating in this case), and that I and other Japanese learners I know had been kind of confused by this usage. Uh...do I get some kind of reward at the end? I think one of the problems with Japanese phrases like this one is that they're not always used literally. And asking whether someone who happens to be a foreigner literally "can eat" X comes across as being condescending and somewhat irrational. If we were all privy to (and could readily follow and understand) genuine, daily life conversations between Japanese people, I'm sure these kinds of misunderstandings would occur less often. *Edit: Wanted to add a Twitter exchange with @jakeadelstein. Jake: @BlueKutsu I lived in Japan over two decades and never really articulated in my head that "Can you eat X" (X食べられますか）meant "Do you like X?" Me: @jakeadelstein Well, "like" may be an oversimplification. It may be something more like "are you ok to eat" X? I'm glad Jake said something, as this whole episode should have taught me to be more precise with my word choice. And perhaps I should add the disclaimer that there may be some discriminatory assumptions on the part of some people who ask this way. Neither I nor my girlfriend can speak for all Japanese people, of course. But after that conversation it's my impression that at least in many cases, what's being asked is not whether someone can physically eat something.